Fetch text data from internet locations. The interface of URLs is available in two versions, according to whether or not the Advanced Settings checkbox is selected. 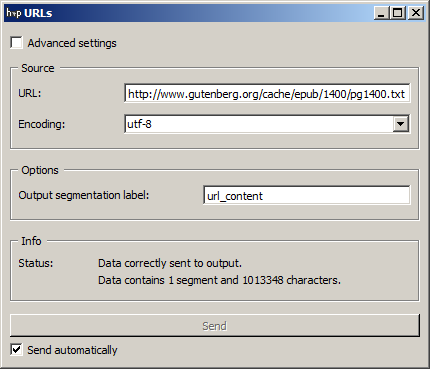 In its basic version (see figure 1 below), the URLs widget is limited to the import of a single URL’s content. The interface contains a Source section enabling the user to type the input URL and to select the encoding of its content. Figure 1: URLs widget (basic interface). The Options section allows the user to define the label of the output segmentation (Output segmentation label), here url_content. The Info section indicates the the number of characters in the single segment contained in the output segmentation, or the reasons why no segmentation is emitted (inability to retrieve the data, encoding issue, etc.). The Send button triggers the emission of a segmentation to the output connection(s). When it is selected, the Send automatically checkbox disables the button and the widget attempts to automatically emit a segmentation at every modification of its interface. The advanced version of URLs allows the user to import the content of several URLs in a determined order; each URL can moreover be associated to a distinct encoding and specific annotations. The emitted segmentation contains a segment for the content of each imported URL. Figure 2: URLs widget (advanced interface). The advanced interface (see figure 2 above) presents similarities with that of the Text Files, Recode, and Segment widgets. The Sources section allows the user to specify the imported URL(s) as well as their content’s encoding, to determine the order in which they appear in the output segmentation, and optionally to assign an annotation. The list of imported URLs appears at the top of the window; the columns of this list indicate (a) the URL, (b) the corresponding annotation (if any), and (c) the encoding with which the content of each is associated. In figure 2, we can see that two URLs are imported (only the end of each URL is visible on the figure) and that each is provided with an annotation whose key is author. The first URL associates value Dickens with this key and is encoded in utf-8; the second one has value Fitzgerald and is encoded in iso-8859-1. The first buttons on the right of the imported URLs’ list enable the user to modify the order in which they appear in the output segmentation (Move Up and Move Down), to delete an URL from the list (Remove) or to completely empty it (Clear All). Except for Clear All, all these buttons require the user to previously select an entry from the list. Import List enables the user to import a list of URLs in JSON format (see JSON im-/export format, URL list) and to add it to the previously selected sources. In the opposite Export List enables the user to export the source list in a JSON file. The remainder of the Sources section allows the user to add new URLs to the list. these must first be inputted in the field with the same name before they can be added to the list by clicking on the Add button. In order for several URLs to be simultaneously added, they must be separated by the string ” / ” (space + slash + space). Before adding one or more URLs to the list by clicking on Add, it is possible to select their encoding (Encoding), and to assign an annotation by specifying its key in the Annotation key field and the corresponding value in the Annotation value field. These three parameters (encoding, key, value) will be applied to each URL appearing in the URLs field at the moment of their addition to the list with Add. The Options section allows the user to specify the label affected to the output segmentation (Output segmentation label). 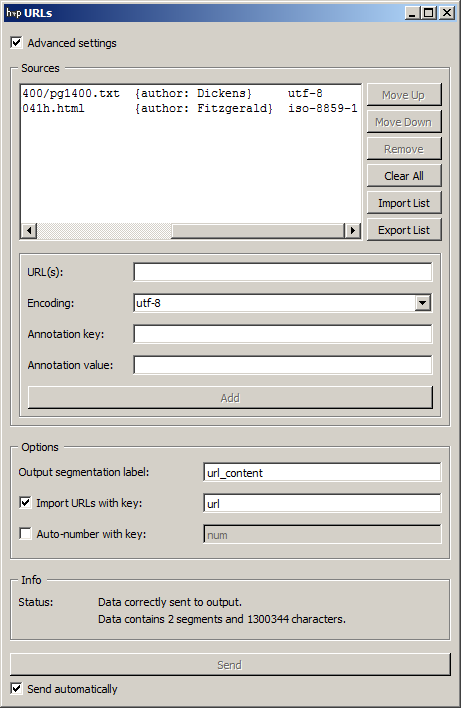 The Import URLs with key checkbox enables the program to create for each imported URL an annotation whose value is the URL (as displayed in the list) and whose key is specified by the user in the text field on the right of the checkbox. Similarly the button Auto-number with key enables the program to automatically number the imported URLs and to associate the number to the annotation key specified in the text field on the right. In figure 2, it was thus decided to assign the label novels to the output segmentation, and to associate the name of each URL to the annotation key url. On the other hand, the auto-numbering option has not been enabled. The Info section indicates the length of the output segmentation in characters, or the reasons why no segmentation is emitted (inability to retrieve the data, encoding issue, etc.). In the example, the two segments corresponding to the imported URLs’ content thus total up to 1‘300‘344 characters. URLs is one the widgets that can be controlled by means of the Message widget. Indeed, it can receive in input a message consisting of a URL list in JSON format (see JSON im-/export format, URL list), in which case the list of URLs specified in this message replaces previously imported sources (if any). Note that removing the incoming connection from the Message instance will not, by itself, remove the list of URLs imported in this way from the URLs instance’s interface; conversely, this list of files can be modified using buttons Move up/down, Remove, etc. even if the incoming connection from the Message instance has not been removed. Finally, note that if an URLs instance has the basic version of its interface activated when an incoming connection is created from an instance of Message, it automatically switches to the advanced interface. Data correctly sent to output: <n> segments (<m> characters). No data sent to output yet: no URL selected. The widget instance is not able to emit data to output because no input URL has been selected. The widget instance has received a JSON message on its Message input channel and the keys and/or values specified in this message do not match those that are expected for this particular widget type (see JSON im-/export format, File list). An URL couldn’t be retrieved and read, possibly because it is incorrect, or because the internet connexion has not been working properly. Encoding error or Encoding error: <URL>. An URL couldn’t be read with the specified encoding (it must be in another encoding).